El Palenque royal palace. Credit: Elsa M. Redmond and Charles Spencer. (Phys.org)—A pair of archaeologists with the American Museum of Natural History has unearthed a palatial compound in El Palenque's plaza in the Oaxaca Valley in Mexico. In their paper published in Proceedings of the National Academy of Sciences, Elsa Redmond and Charles Spencer describe their work, what they have uncovered and how their findings fit with the emergence of organized states in Mesoamerica. The Oaxaca Valley near the southern tip of Mexico has been offering up clues of past civilizations for several decades—a team has been working at the El Palenque site in particular since 1993. In this new effort, the researchers focused on a dig on the north end of the plaza—the site of what the researchers believe was the home and business center for the ruler of an ancient empire. The palace has been dated to approximately 2,100 to 2,300 years ago, a time before the Aztecs. Most in the field believe that the civilization that existed in Oaxaca was among the earliest states to come into existence in Mesoamerica. Redmond and Spencer suggest that their findings at the palace site back up that theory. 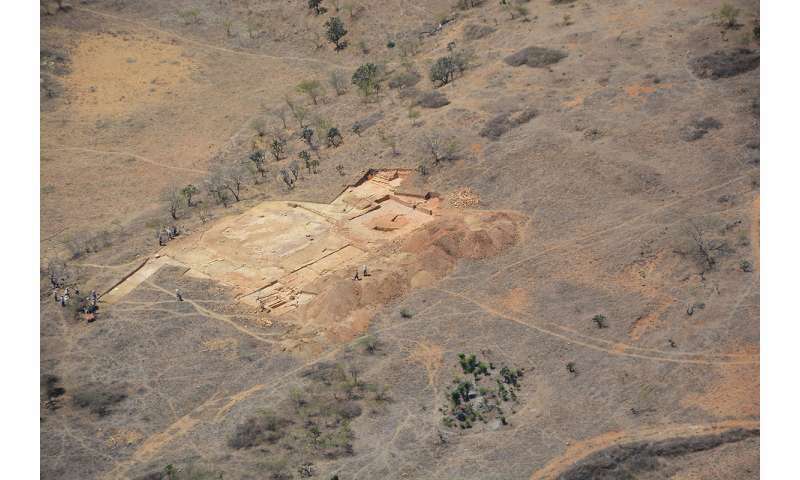 The palace, the pair report, was well preserved and covered approximately 2,790 square meters and had not only living quarters for the ruler and his family, but business offices, a staircase, a dining area and a place to perform sacrifices. The researchers report that construction techniques used by the builders suggest the building was designed ahead of time and that it was likely a single construction effort that would have taken a lot of organization. Also, its large size demonstrated that the ruler had a lot of manpower at his disposal. The researchers also note that personal details are still evident in some parts of the palace, such as the cistern for collecting rainwater in the residential quarters and the drain carved into stone to bring in fresh water and remove waste. Water shrine, where a stone-lined drain descending from ruler’s residence supplied rainwater to cistern. Credit: Elsa M. Redmond and Charles Spencer. Redmond and Spencer suggest that the palace is likely one of the oldest multifunctional palaces in the valley and offers more evidence of the advancement of an organized state in the area. Recently completed excavations at the site of El Palenque in Mexico's Valley of Oaxaca have recovered the well-preserved remains of a palace complex dated by associated radiocarbon samples and ceramics to the Late Formative period or Late Monte Albán I phase (300–100 BC), the period of archaic state emergence in the region. The El Palenque palace exhibits certain architectural and organizational features similar to the royal palaces of much later Mesoamerican states described by Colonial-period sources. 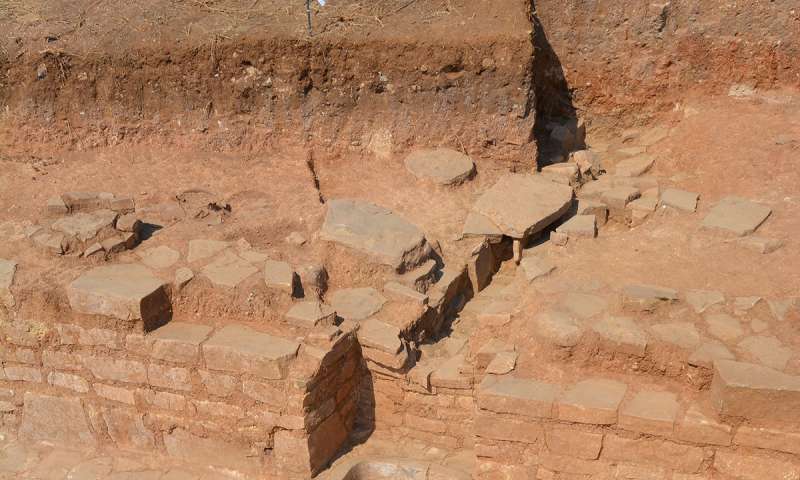 The excavation data document a multifunctional palace complex covering a maximum estimated area of 2,790 m2 on the north side of the site's plaza and consisting of both governmental and residential components. The data indicate that the palace complex was designed and built as a single construction. The palace complex at El Palenque is the oldest multifunctional palace excavated thus far in the Valley of Oaxaca.